Praised for its accessible approach to teaching disciplinary writing, the first edition of An Insider’s Guide to Academic Writing was embraced by instructors and students at two-year and four-year schools alike. With its flexible, transferable frameworks and unique Insiders video interviews with scholars and peers, the text enables students -- and their instructors -- to adapt to a variety of writing situations in different disciplinary discourse communities.In the second edition, the authors build on that proven pedagogy with additional support for the writing process, critical reading, and reflection, to give students even more help with academic writing, no matter the discipline. 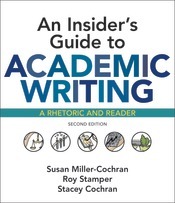 Featuring two books in one, an innovative rhetoric for academic writing (available as its own book) and a thematic reader with readings from the disciplines, An Insider’s Guide to Academic Writing is based on the best practices of a first-year composition program that has trained hundreds of teachers who have instructed thousands of students. Also new to the second edition: a Launchpad with a complete e-book, in addition to modules about writing in applied fields.